Khaled and Mariam are wonderful and professional people.They understood our needs and helped us bought our new house. Surely recommended for your Real Estate needs! Khaled and Mariam are simply amazing, caring and friendly professionals. They helped us with our home buying and the experience was just amazing! Surely recommended for your Real Estate needs! Will go above and beyond to ensure you are satisfied! Professional, friendly and will go above and beyond to ensure you are satisfied... great service. Khaled and Mariam are simply the best to sell or buy a home. Their care and commitment to finding or selling a home for their clients is unmatched by any other. As first time home buyers we had no idea what to expect. They made our first time home buying experience a breeze. They were a constant source of suppport and knowledge in showing us houses that met our criteria as soon as possible. They make the whole process a pleasant experience for their clients. So much so that I had them sell and buy my parents home. They sold my parents home for the price they wanted and helped them find the house they were looking for. I highly recommend them to anyone who is looking to buy or sell real estate. Highly Professional, Thorough, Competent and Trustworthy Team! Highly professional, thorough, competent and trustworthy team of Khaled and Mariam Sarwar - Re/Max Premier Inc. provides a great before and after sales experience while buying a house. As first time home buyers we wanted someone who could take us through home buying through every step and we were in awe of the thoroughness of Khaled and Mariam's work. Both Khaled and Mariam are meticulous in their approach and work together as a team to deliver a great service. Khaled provided excellent direction for our initial thought process and then helped us in finding out the pros and cons of all properties, followed by advice on making the right offer to conducting home inspection and subsequent closing while patiently answering all our questions. Mariam provided a lot of thoughts throughout the process and was very helpful and thoughtful at the time of moving in. We are happy that we chose you as our realtors (and subsequently, our friends!). Thanks Khaled and Mariam, you are a great team and we'd recommend your services to our friends and everyone looking for a property in GTA. We really appreciate what you have both done for my family. We are very lucky to have met two individuals that are as dedicated, kind, trustworthy and helpful as you both! 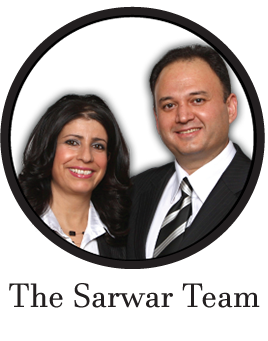 We highly recommend everyone to choose to work with the Sarwar team! Amazing service throughout both the homeselling and homebuying process. They helped us find the perfect home for us. We would definitely recommend Khaled and Mariam for anyone planning to buy or sell their property because of their dedication.